My children all love The Berenstain Bears. I have read these books, read them to my brothers, and now read them to my own children. Gmail has loved all of their books and would often pick out one of these books at the bookstore from the time he started walking. They discuss real life events that children often experience and a way that they are solved. And, status quo with children’s books, they end happily. 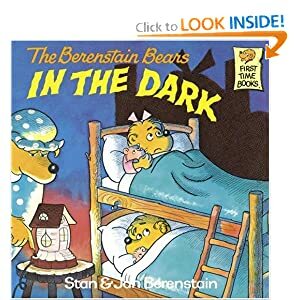 In, The Berenstain Bears in the Dark, Brother Bear reads part of a scary book to Sister Bear. At bedtime, she is afraid of the dark and Mama Bear places a night light in their room to help ease her fears. As it turns out, Brother Bear needed the light too. Why are kids afraid of the dark? Are they afraid of the things that go bump when everything around them is quiet? Are they afraid of the creaky floors and doors? Are they afraid of who might be lurking outside? The fear of the dark is also the fear of the unknown; all of those things that you can’t see because the room is dark. Our lives are well on their way to a serious upheaval that is supposed to be in everyone’s best interest. We are quickly… much quicker than I expected, and much quicker than I think I was prepared for… on our way to the placement for Gmail. And, frankly, I am scared to death. I am terrified of the unknown that lies ahead. I am terrified of handing my beautiful baby boy over to someone I don’t know. I am terrified of handing my beautiful baby boy over to someone who also has other children with serious issues in their care. How do I know he will be safe? How do I know he will come home with the progress and improvement he is supposed to? I am absolutely paralyzed by fear. I am sitting in a very dark room. My chest feels so tight I can barely breathe. It feels just like it did when I was a small child and I heard the things that go bump in the night. My mind is cluttered, I can barely think through making dinner, much less thinking through how to move forward. My palms are sweaty, I am on edge, my anxiety is out of sight. I feel like a little girl waiting for the monsters to pop out from under my bed or out of my closet door. I am petrified. This verse has been one of my favorites since I was a small child. God is our night light in the dark. If we reach out, God will light our paths. He will hold us close and keep us safe. God will take our fears and replace them with the power to move forward with Him in charge. He will replace our fears with His love, the love for Him, and the love for others. He will also erase our fears and replace them with a sound mind. A mind that will function in a more efficient and successful way. If we let God be our night light, He will light the way. God is my Lord. He is holding my hand, He is helping me, He will help me, He will be my night light. God is in control. He will also hold your hand, He will help you, He will be your night light in the dark. Do not be afraid, join me. Let go of your fears, as I let go of my fears. Give these fears, the anxiety, the uncertainty, the dark all to God. Let go of it, let God control it. He will, but only if we let him. Reach out, hold my hands while I hold your hands. Together, we can let go of our fears and hold hands with God, the One who is truly in control, and He will comfort us and light our way. Previous Post Mommy, the word that God made possible. Those are some serious fear words.